Over the years, we have had several corporate events, particularly during the Holiday Season. Some company parties only require a single room, while others link two rooms together, or rent the entire facility. Our affordable rates and customized plan offer any company or organization a great opportunity to host a unique and exciting company party for the entire family. Very few venues, if any, can cater to adults and children as well as we do. Our spacious facility offers seating for as many as 120 people. Play options include 3 bouncy castles, 3 large play structures, smaller play equipment for the younger kids, a rock climbing wall, and a wide range of game tables for kids and adults alike. As we get to know the needs of a company, we cater the party experience to their requirements. Companies returning year after year have noticed a more personalized service as we develop a relationship with them. 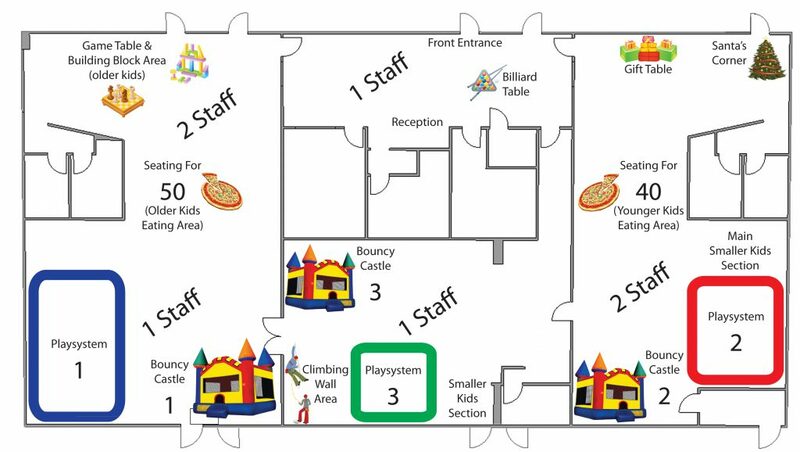 Below is an example of a full facility layout for an annual company party. We cleared the seating in room 3 to accommodate more open space, added specialized areas for older and younger kids, and had extra supervision to ensure a fun and safe experience. We would be happy to put you in touch with past companies, if you are interested in finding out how their event(s) went.